New in November! 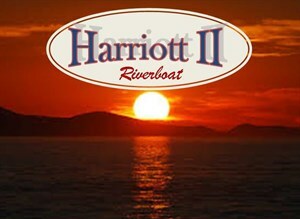 Come watch the Sun Set along the Alabama River with a relaxing ride aboard the Harriott II. This cruise is two hours long and offers a variety of meal options from our Wheel House Grille and delicious beverages to purchase from our cash bars located on all 3 deck. There's no better way to spend your Saturday! All ages welcome. Cruises rain or shine. Tickets are non-refundable and non-transferable. For groups larger than 25, contact our office at 334-625-2100.